The Rubber Cafe Design Team Blog: The Perfect Moment! Hello TRC Fans! Today I have some fun stuff to share with you. First I have a quick video showing all the contents of the January Creative Cafe' Kit - It's A New Year! I really love the colors and embellishments included in this kit. I also want to share a quick and easy card that you can create using your supplies from the kit! I cut the white cardstock longways to 4 1/4 x 11" and scored it at 5 1/2" to create the base. I cut two strips of patterned paper and layered them onto the card front. Then I added the chalk tape (included in kit). I stamped the sentiment onto a die cut rectangle and layered onto a scalloped rectangle. I stamped the coffee cut and colored it with markers then fussy cut it out. I used some foam squares to attach the coffee cut to complete the card. 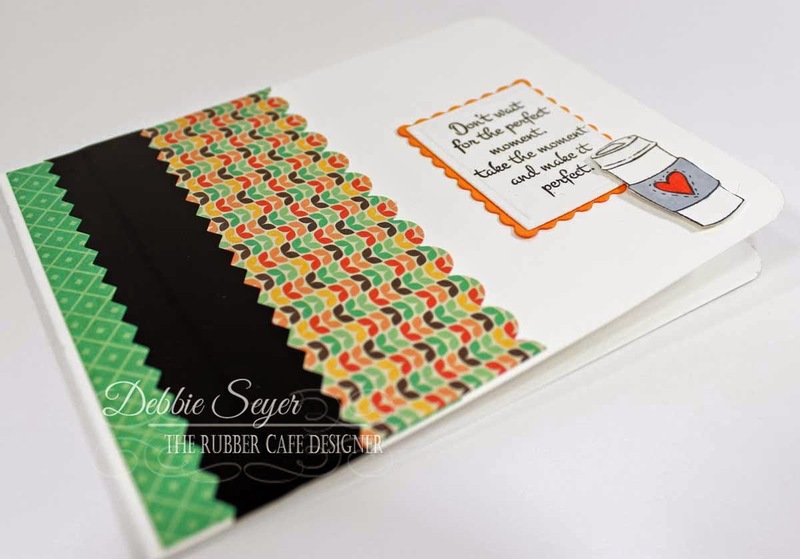 Stamps: The Rubber Cafe' - January -Creative Cafe kit-"It's a New Year"